By now everyone should know that the Polka is not a National Dance in Poland, but rather, Polkas come from old folk tunes (even war songs), set to a dance beat by Polish Americans. And there are many styles of American Polka, with its 2/4 time syncopated beat (as opposed to the German 3/4 time polkas). The style that just about everyone knows is the Eastern Style (played by Frank Wojnarowski and Jimmy Sturr) which is fast and bouncy. That style is popular in New York City, Pennsylvania, Massachusets, etc. Then there is the Chicago Style Polka (played by Eddie Blazonczyk’s Versatones and Marion Lush), which is slower, and danced with more of a slide and lock-step. That is popular in Buffalo, Chicago, Milwaukee, etc. Gaining popularity in the same region is the Honky Style Polka (Li’l Wally’s early Chicago style is good example), which is funkier, with extra syncopation. Finally, there is the Old Country Style (Po Starym Krajsku) which features fiddles, making it sound like the Polish Highlander (Góralski) music. 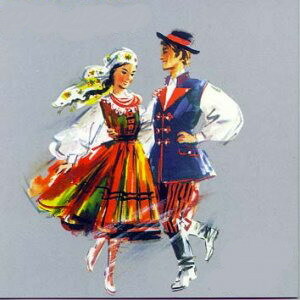 There are also the Obereks (which actually are a national Polish dance), and Waltzes, both in 3/4 time, which also derive tunes from old Polish folk songs. So, turn up the sound and get out your dancing shoes, and listen to some examples of Polish Folk Music, which has made its way to America, via the Polka beat. Gallery | This entry was posted in Dance Mix, Polish Music and tagged Andrzej Obrochty-Bartuś, Chet Kowalkowski, Chicago Style Polkas, Dynatones, Eastern Style Polkas, Eddie Blazonczyk, G-Notes, Goranie, Honky Style Polkas, Jan Piwowarczyk – Makowska Orchstra, Jimmy Kilian & Honky chicago, Kapela Bukowiane, Kapela Gacki, Kapela Józefa Gąsienicy Brzegi, Kapela Józefowskich, Kapela Ludowy z Poniatowej, Kapela Ostrzewianie, Kapela Staszka Maśniaka, Kapela z Mydlnik, Li'l Wally, Marion Lush, Mazowsze, Mały Władziu, New Brass Express, Oberek, Ogniem i Mieczem, Pieśni Patriotyczne, Po Starym Krajsku, Polish folk music, polkas, Polska Radio Orkiestra, Ray Jay & The Carousels, Toledo Polka Motion, Versatones, Waltz, Zespół Lemkowyna, Zespół Oławiany. Bookmark the permalink. Great and well done music that brings back memories. Thanks.